Why do we all have to feel beautiful to prove we're confident? 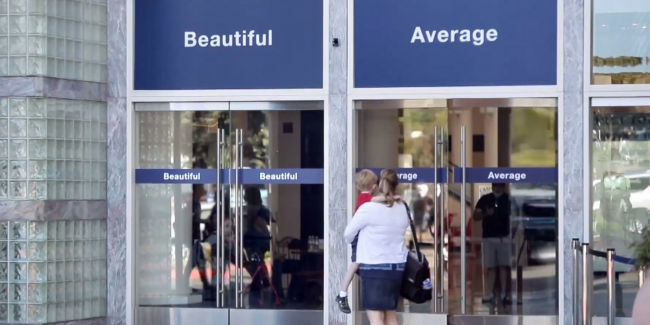 The recent Dove campaign that has got every talking shows shopping malls in the UK with two entrance doors; "Beautiful" and "Average". The majority of the crossness I read online about the ad discussed the fact that the women only had those two choices to walk through, not "smart" or "strong" etc. It got me thinking about what made me cross about it, and I finally figured it out. I hate the idea that women are expected to prove their self acceptance by believing they're beautiful. Firstly, we're not all beautiful. There I said it. We're all beautiful to someone, even if it's just our mothers, but we're definitely not all beautiful. We may be pretty, striking, attractive, but not always beautiful. I've never understood this need for us all to meet this criteria to confirm our self worth. Secondly why is our acceptance of ourselves so linked to liking how we look? Are little boys told they must believe they're beautiful? Are men constantly told that they need to feel beautiful? Maybe we are fully capable of feeling awesome and proud of being smart, or kind, or strong? Why must all women be beautiful? Dove's campaign, disguised as a body positive campaign of course, actually is still an ad designed to sell us products to help us be beautiful. Rather shockingly I want my body moisturiser to make my skin soft, not beautiful. When will we lose the myth that all women need to feel beautiful? Not all of us can be models, but we all have attributes we can beam to the world about. Beauty is a luck of the drawer gamble, you just are, or you're not. Hardly something to base all of ourself esteem on.